Lets get ready to have some travel time with cheaper deals for airport car parking. 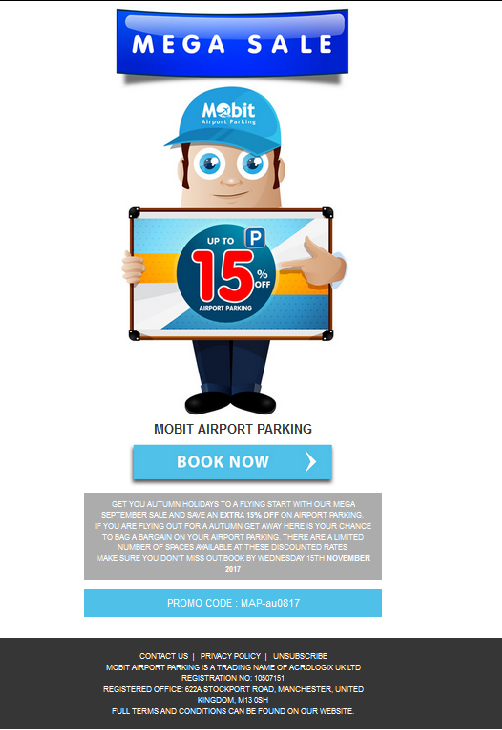 Compare airport parking prices at Mobit Airport Parking and save 15 % off on airport parking deals. These discount deals are valid until Wednesday, 15th of November, 2017. The offer can be reserved for Christmas or New Year travel. To avail this offer, click on the voucher below or copy this “MAP-au0817” code to the discount code option at Homepage from here. Limited spaces are available for this discount deal, so make sure you don’t miss out this exciting Autumn offer.